Astwood Cove is a small secluded beach ringed by steep cliffs. The rocks abound with the nests of longtails and the birds are frequently seen swooping through the sky above. Snorkelling is good but the water can get pretty rough. With the added danger of many rocks and with no lifeguards, it’s only recommended for more advanced swimmers. The beach has no concessions and is rarely busy. Astwood Park looks over the cove and is a favourite venue for outdoor weddings. 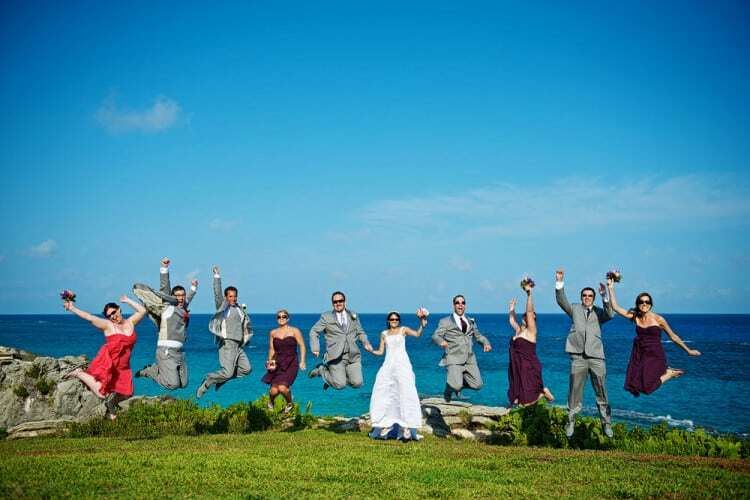 The Atlantic Ocean provides a stunning backdrop for wedding photographs. The park is large and can accommodate large wedding parties. It has picnic tables and toilets. To hold a wedding ceremony at Astwood Park you need to obtain an event permit from the Department of Parks. Permits cost just $25. Lots of tourists and locals choose to get married here so early booking is recommended, especially if you are planning a summer wedding. A deposit is payable if more than 50 guests are expected. It’s refundable provided the site is left in decent condition. The main photo on this page shows a wedding ceremony taking place at Astwood Park. It was supplied by Howarth Photography. More photos of weddings here can be seen in this gallery. Astwood Cove and Park are situated just off South Road in Warwick Parish. There is plenty of parking for cars and mopeds. Visitors travelling by public transport should take bus number 7 from Hamilton or Royal Naval Dockyard (Kings Wharf/Heritage Wharf). The path to the beach at Astwood Cove is fairly steep. Less able visitors may have difficulty getting down. Elbow Beach, Horseshoe Bay, Warwick Long Bay, and Jobson’s Cove are all nearby and have easier access. Astwood Park is completely accessible. If you’ve arrived at this page looking for Astwood Cove guest apartments, stop your search now. The business closed to tourists many years ago and is now used for housing staff working at the Fairmont Southampton hotel. 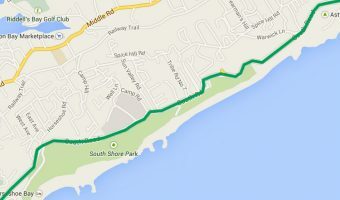 Map showing location of Astwood Cove & Park. Nice beach and rock formations but very difficult to reach. You have to walk down the side of a cliff to get the water. There were steps but they were quite hazardous. It can be done but I wouldn’t recommend it for old people. It is still worth coming here to see the park though. There are no access problems here. The views are stunning and there are picnic tables and restrooms. There’s nowhere to buy food or drink so you need to bring your own if you want a picnic. We came on a scooter and there is a place to park. Wonderful photos of wedding ceremonies at Astwood Park.